Posted on June 6, 2012 by Elizabeth B. It was a dragon who helped me learn to read. When I was three, my mother read book after book to me and my baby sister. Our absolute favorite was Jane Belk Moncure’s A Dragon in a Wagon, a Magic Castle Readers book about different ways to travel. 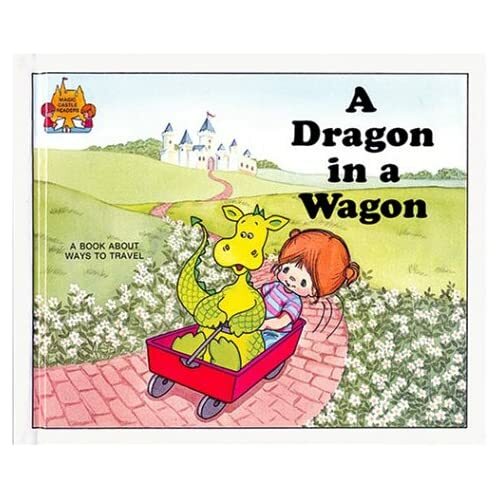 In the story, young Megan opens a “Word Window” to find a dragon sitting in a wagon. He invites her on a ride that soon progresses to a car, bus, boat, sled, and other means of transportation as they pick up animal friends along the way. Eventually, they wind up at a circus, where the dragon hops into a circus wagon and Megan says goodbye as she heads home. The story is cute and rhymes, but it is simplistic and not terribly unique—after all, it is about teaching kids words about traveling, and Janette Rainwater wrote a Little Golden Book by the same title years before the Magic Castle Readers series existed. So what made me keep it stashed away all those years? It was the way it presents books as Word Windows. When you are growing tall. And you want to open them all. Megan opened her Word Window and found a friendly dragon. Even when I was three, I longed to get my hands on the books in a magic castle and have my own adventures. I was determined enough to make it happen, too—after I read my first book (not A Dragon in a Wagon, which I had memorized, but the adorable Are You My Mother?) when I was four, I spent years making frequent library trips, bringing home piles of my own Word Windows in bulging bags and living adventure after adventure through their pages. That, coincidentally, is where I discovered so many of the dragons that made me fall in love with them. A dragon led me to my love of books, and my love of books led me to my love of dragons. Thanks to a dragon in a little red wagon for making this all possible.